Private Property On 3.5 Hectares With Main House, Park And Beautiful Views. Lots Of Potential ! Sweet Home With 65 m2 Of Living Space, Garage Of 70 m2, Attic To Convert And Garden Of 115 m2. Beautiful Property With Main Residence, B&b And Gite On A 1703 m2 Plot With Pool. Property With Gite And 2 Annexes On About 1ha Of Land With A Private River Bank. Beautiful Character House With 340 m2 Of Living Space, 5 Bedrooms, Garage And Terrace. Beautiful Equestrian Domaine On 23 Hectares With Farmhouse, B&b, Bar/restaurant, Indoor Arena. Renovated Stone Barn With 160 m2 Of Living Space, Large Courtyard With Pool And No Overlooking. Exceptional Location For This House With 160 m2 On 3080 m2 Including 2 Buildings Plots. Beautiful Renovated Home On 1840 m2 Of Land With Pool, Stone Outbuilding And Gite. Renovated Stone Home With 200 m2 On 11660 m2 Of Agricultural Land, Exceptional Location ! Pretty Stone House With 136 m2 Of Living Space, Garage And Sunny Terrace ! Pretty Stone House With 290 m2 Of Living Space, 6 Bedrooms And Garden Of 600 m2. Traditional Villa With 140 m2 Of Living Space On A 469 m2 Plot Without Overlooking. Single Storey Villa With 3 Bedrooms And Garage On A 715 m2 Plot With Pool And Views ! Detached Villa With 137 m2 Of Living Space On A 1451 m2 Plot With Pool And Superb Views ! Saint-Nazaire cathedral overlooking the river Orb, Béziers Once Greek then Roman, Béziers is a very old city (perhaps the oldest in France), set on a promontory above the Orb and the Canal du Midi. It is well known for its Mediterranean climate, proximity to the coast and its famous feria in August which attracts a crowd of afficionados every year. It's truely well connected with both river and road networks, as well as being a lively town and a very pleasant place to live. A stroll along the Plateau des Poètes or beneath the plane trees in the Allées Paul Riquet will convince you of that. 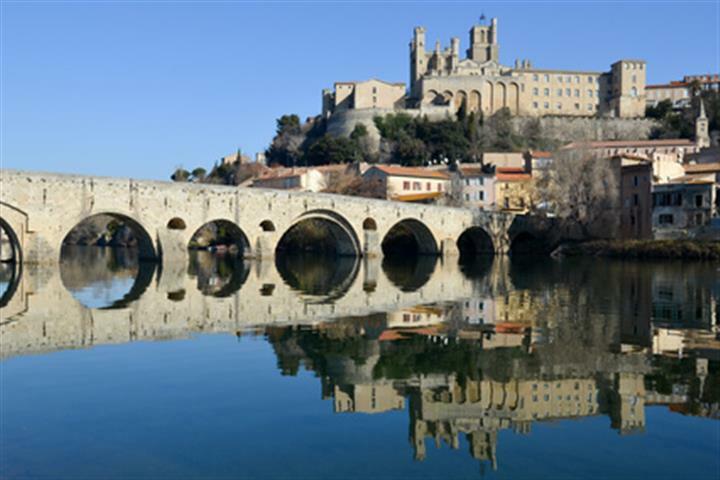 Whatever your wishes or budget, you should easily find a property to buy in Béziers or the surrounding area because the property market is buoyant with particularly affordable prices: apartments or maisonettes in Béziers, village houses on the outskirts and, for deeper pockets, top of the range villas or wine-growing properties.